Banning Diego Costa for eight matches was bound to happen but don’t expect him to suddenly change his personality after he returns. We all woke up with the news that Diego Costa received an 8-match ban from La Liga after insulting referee Gil Manzano last weekend. 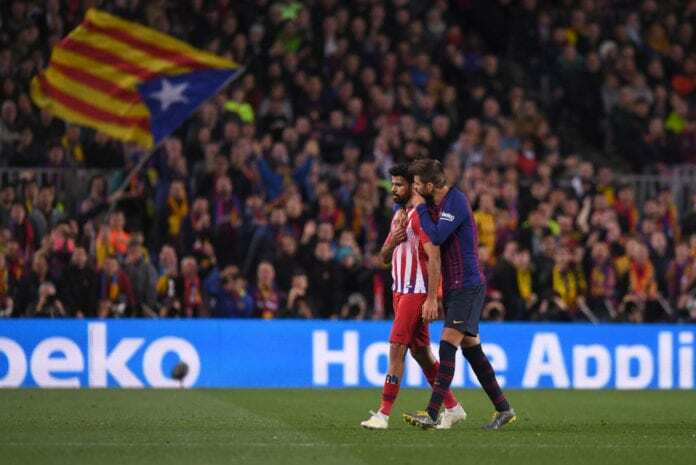 The Spanish/Brazilian player was completely out of control during Atletico Madrid’s visit to Camp Nou, his behavior got him sent-off and he compromised his teammates. The Colchoneros felt the need to completely relinquish their attempts to score any goals after the player saw the red card, he is to blame for Atletico’s defeat. Now that we’ve established this, we can move out attention to the psychological profile that Diego Costa has. We have an extremely competitive player who tends to lose his cool too often during the most intense matches. Costa is famous for his bust-ups even with teammates and has always been as unapologetic as he looks both on and off the pitch. Everybody was expecting a ban from La Liga but all the Atletico Madrid camp condemned the measure as excessive. However, you will never see any Atletico Madrid player or manager trying to change Diego Costa’s attitude. This man is a complete lost cause who will never change his demeanor or behavior for his club’s sake. Even Diego Costa has stated in the past that he likes the way he behaves with his rivals. Let’s look at two similar cases in order to further demonstrate our theory. We can easily create parallels between Costa and Barcelona striker Luis Suarez. The Uruguay international has been involved in a handful of situations that have even brought him bans that are more severe than Diego’s. Luis Suarez’s behavior is more complicated because it is more physically violent than Costa’s. It all started back in 2010 when the Barcelona striker played for Ajax in the Eredivisie. During a match against PSV Eindhoven, Luis bit opponent Otman Bakkal and was suspended for seven matches. Suarez took his bad tradition to the Premier League and bit Chelsea defender Branislav Ivanovic during a match. The Liverpool forward received a 10-match ban for this action. Last but never least, we had a third incident in which Suarez bit Giorgio Chiellini during the 2014 World Cup match between Uruguay and Italy. Suarez received a new ban by FIFA that extended throughout the rest of the year and he vowed to never do it again. Luis decided to change his behavior after going through these incidents. He suffered online harassment and we haven’t seen him involved in a situation like this ever since. But Luis Suarez has always been a more relaxed individual at heart when you speak to him in private. Contrary to Diego Costa’s more incendiary behavior off the pitch, the Uruguay international avoids all types of conflict at all cost. The Barcelona layer was humble enough to accept that he needed help and he didn’t hesitate to fight for change. We can see how his decision to modify his behavior has affected him in a more positive manner at his club. Diego Costa keeps being supported by all his teammates because they approve of his behavior and this is the reason he might never change. Manager Diego Simeone keeps praising Costa’s “fighting spirit” at every chance he gets and this seriously affects the player’s psyche. Even after he returns from that 8-match ban, there is no chance that he will see the error of his ways and try to make that conduct shift. Even though Diego Costa’s terrible mannerisms are not physically violent, he is still considered one of the most provocative players in the world. When he is not having a great performance for his squad, Costa usually tends to provoke his rivals thinking that he is helping his teammates. But this latest experience proves that he affects way more than he contributes to the cause. Why do you think Diego Costa behaves as he does during matches? Please share your opinion in the comment section down below.